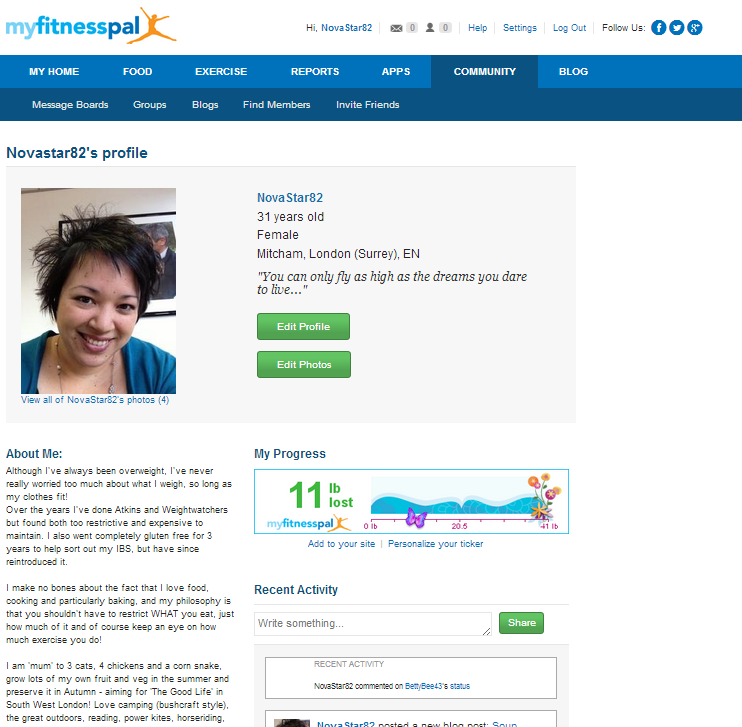 One particular website / app deserves a special mention in my health journey, and that's MyFitnessPal. In it's simplest terms, it is a free method for helping you to achieve your weight goals by restricting calories according to your activity levels, however the community aspect is (in my opinion) invaluable, the phone app is very handy when you're on the go, and it syncs with many other apps and devices to provide an even more accurate report of your calories in and out as well as other stats (I've got my Fitbit linked to my account). As would be expected, you can check in with your current weight and measurements to log progress, as well as enter anything you've consumed and your daily exercise. When you initially sign up, you enter your current stats, weight, activity and also your weight and fitness goals, and MFP gives you an estimated daily calorie intake based on your required weekly weight loss (or gain). You can choose to simply follow its recommendations, or if you prefer to use your own TDEE (Total Daily Energy Expenditure) amount, you can set your own custom daily goals including nutrient levels. Entering foods is relatively simple; the food database is largely user-generated so although sometimes you have to double check the nutritional information, it does mean the database is pretty comprehensive for many countries - something that many other weight resource sites fail on. You can also enter and save your own recipes, which is great if there are certain meals you eat regularly or cook in larger amounts but want to know the calorie value of a single portion. The community aspect is also not to be sniffed at although it can definitely be an acquired taste. Whilst the forums are not the easiest to navigate and you do get the usual set of trolls, there are also many users with tons of experience who are willing to share their knowledge and focused groups for pretty much anything to be honest. Friends can be added to your 'friends list', and you have the option of sharing your food and exercise diary with them for support, motivation or advice - I personally find some of the best conversations are via my friends 'News Feed' and it's great knowing there are so many people in the same boat as you. Although the phone app doesn't give easy access to the forums, you have full access to your News feed, food and exercise diary and reports etc (see screenshot). The phone app also has the awesome feature of being able to add foods via barcode, which is particularly helpful if you are out and about. Essentially, MyFitnessPal is there to support a lifestyle change rather than just focusing on weight loss, and it understands how important having a support network is when making big changes. As there is no weekly weigh-in and you are essentially left to make your own decisions, it is definitely a tool that requires a good degree of self motivation and dedication to get the most out of it. Losing weight is simply a matter of consuming less than your body is expending, and simply having a better awareness of how many calories there are per portion of food, makes it much easier to control this. I've got my goal set to lose 0.9lbs per week and I can reliably say that I've met or slightly exceeded this goal consistently since I started logging back in November 2013.